* This app is designed to solve a specific problem. 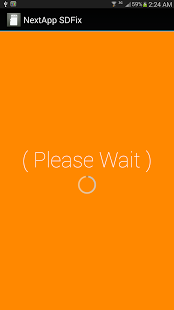 If you don’t have that problem, don’t install this app. * This app is only useful on devices that have a user-installed MicroSD card. If you have a Google Nexus device or other device without a MicroSD card that you physically installed yourself, then this app isn’t going to be helpful. * This app is likely only useful if you have a stock ROM. 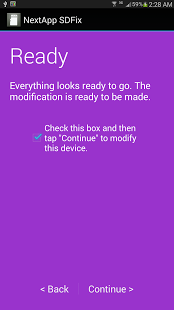 If you’re running an aftermarket ROM like Cyanogenmod, then there is no reason to install this app (good aftermarket ROMs don’t suffer from the problem that this app corrects). 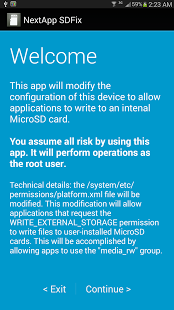 NextApp SDFix will modify the configuration file located at /system/etc/permissions/platform.xml to allow apps to write to the MicroSD card. Specifically, SDFix will add the Android UNIX group “media_rw” to the WRITE_EXTERNAL_STORAGE permission’s configuration. This will enable apps (only those that you granted write access permissions to when you installed them) to write files to the MicroSD card. On many devices, this is effectively reverting the state of this permission back to the way it was configured in Android 4.3. This modification is carried out by modifying the existing XML file, rather than replacing it.